Created in the tragic wake of recent teen suicides in the Comox Valley, the Comox Valley Suicide Awareness group has been heroically challenging local residents to find a community-wide solution. Awareness is key with issues that have such widespread impact. As it pushes 1,500 members, the group’s Facebook page has become the core springboard for sending out their message. The group’s founders hope to push their message further with the initiation of a ribbon campaign, kicking off this evening at Mark R. Isfeld Secondary School. The community forum on suicide awareness runs from 7:00 p.m. until 9:00 p.m. at Mark R. Isfeld Secondary School’s gymnasium. 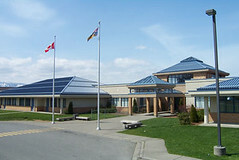 The school is located at 1551 Lerwick Road in Courtenay. The group hopes to have 500 ribbons on hand, all available by donation. For more information, join the Comox Valley Suicide Awareness group on Facebook.